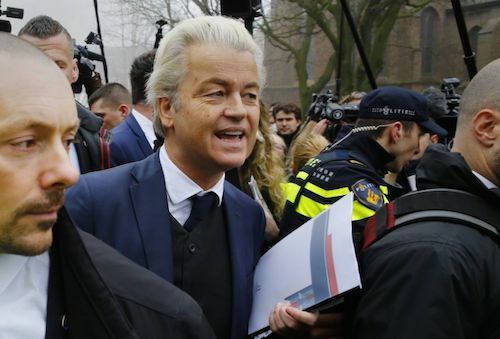 Far-right populism has been dealt an unexpected blow in the Dutch election, after Geert Wilders' Freedom Party secured only 20 parliamentary seats out of 150. But the movement, which claims to put the interests of ordinary citizens first, isn't going away. Wilders' anti-immigrant, anti-EU party secured 13 fewer seats than the liberal People's Party (VVD), but the Labour party (PvdA) dropped from 38 seats to just nine. Its leader - who pledged to ban the Quran and shutter all mosques in the Netherlands - will be hugely disappointed, having led the polls in recent months. His shortfall of support may also call into question whether populism's vaunted resurgence in mainland Europe is losing steam. It may be faltering on the right - the chaos of US President Donald Trump's administration might be a factor - but left-wing populism looks poised to flourish in the coming months, both in Europe and beyond. The term 'populism' has dominated political discourse since the dual shock of Brexit and Trump's electoral victory in 2016. Many predicted this tide of reactionary, anti-establishment sentiment would crash into European elections, especially given the recent backlash against immigrant communities in Sweden, Germany and other EU countries. But last December, after a contested re-run of their presidential election, Austrians opted to elect Alexander Van der Bellen - a member of the Greens party, which aims to protect the rights of both minorities and the environment. Van der Bellen, who ran as an independent, defeated Norbert Hofer, leader of Austria’s answer to the Freedom Party. Hofer was widely viewed as the embodiment of populism; after all, his pragmatic charisma and marketable policies narrowly won him the first election. Austria’s Greens secured a landmark victory, but it has been largely ignored by media fixated on the right. Similarly, Netherlands' own GreenLeft - propelled by the magnetic enthusiasm of young leader Jesse Klaver - were arguably the biggest winners in this election, expanding from four to 14 MPs. They may even serve as kingmaker, as 75 seats are needed to form a coalition government. Klaver's post-election speech was an unmistakable rebuke of populism. “What I would say to all my leftwing friends in Europe: don’t try to fake the populace,” he said. However, the concept of 'right' and 'wrong' brands of populism is exactly the attitude which feeds its existence. In reality, it manifests on the right and left with equal prominence. The French presidential election showcases the distorted narrative. With the first round of voting taking place in April, all eyes have turned to famed populist Marine Le Pen, head of the right-wing Front National party. This voyeuristic monomania has opened the door for Emmanuel Macron, an independent running with ‘En Marche!’, a progressive movement he founded just one year ago. Macron, a former banker, has broken Le Pen's monopoly on the masses with his own populist rhetoric. The astronomical rise of ‘En Marche!’ is testament to his common touch and astute manipulation of public discontent. As many leaders try to appeal to the masses, distinguishing populists from other politicians isn't always easy. But look closely at some of the world's leading liberals, and there's a clear populist streak under the surface. Bernie Sanders, who vied with Hillary Clinton for the Democrats' presidential nomination, has railed against Wall Street, international trade deals and economic inequality. Labour leader Jeremy Corbyn has enjoyed the perpetual support of Momentum, a grassroots group of supporters. And Italian comedian and blogger Beppe Grillo helms Italy’s 5 Star Movement, an anti-establishment party. Arguably the real losers in the Netherlands, and Europe more broadly, are the centrists. People on the right and the left are more polarised than ever, and both groups have grown increasingly frustrated with the status quo. Populism has a bright future on both sides of the divide.